The Logitech G513 is a mechanical gaming keyboard available since April 2018. It looks similar to the Logitech G413, but offers more features. The illumination of the Logitech G513 supports the full RGB spectrum. More than 16 million colors are available and can be customized for each key individually. And of course, there are various lighting effects and animations available. Thanks to Logitech’s Lightsync technology, the illumination of other compatible devices can be synced with the keyboards lighting. The keyboard further comes with a memory foam palm rest and twelve additional gaming keycaps. These can be used to swap out the keys for the numbers one to five and the letters Q, W, E, R, A, S and D. Conveniently a keycap puller is also included in delivery. The illumination, the gaming mode and macros for the function keys can be configured via the Logitech gaming software. The G513 supports 26-key rollover, you therefore never have to worry about whether your inputs will be recognized correctly. There are three different switch types available for the Logitech G513. You can choose between the tactile and linear Romer-G Switches and since summer 2018 you also have the option of the GX Blue Switches with audible feedback. The switch comparison guide offers further information about the different mechanical switch types available. "A few quirky features and a sturdy feel give the Logitech G513 a real appeal compared to the competition." "The G513 represents another strong effort from Logitech's gaming branch, with the successful introduction of a linear key switch." "Logitech's G513 is more than an attractive, professional-looking keyboard. 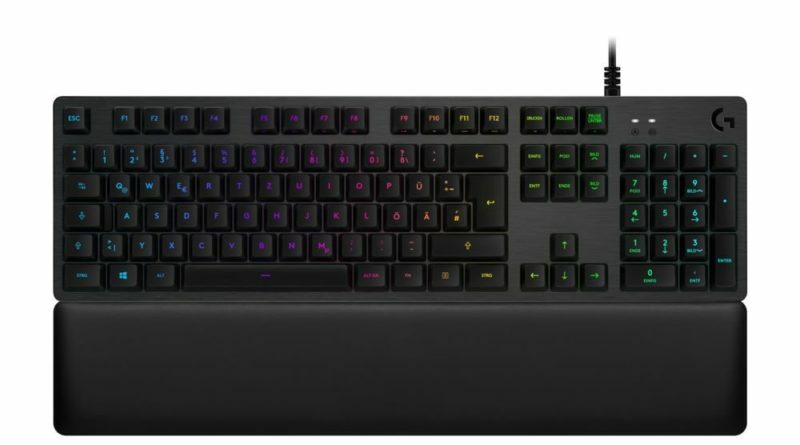 It's also the debut of Logitech's new Romer-G Linear switch, a Cherry MX Red-like switch that finally gives Logitech lovers some options." "The Logitech G513 isn’t a direct sequel to the incredibly affordable Logitech G413, but rather a mid-range keyboard with the best linear key switch." "Logitech's new G513 is well-built and fun to use, with top-notch build quality, fast switches, and great lighting." "Die G513 kombiniert ein schlichtes Äußeres mit präzisen mechanischen Schaltern und Extras wie einer Handballenauflage und einem USB-Hub. Separate Multimedia- oder Makrotasten gibt es aber nicht. "